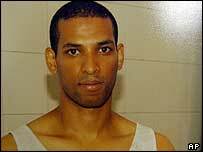 1: Yassin Hassan Omar, 24, wanted over bomb attempt on Tube near Warren Street. Police believe all four 21 July London bomb suspects are now in custody after armed raids in the capital and Rome. 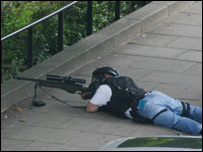 Roads were sealed off in west London as dozens of police, many armed and some in gas masks, surrounded properties. Two men held in north Kensington were filmed by a witness stripped to the waist after police raided a flat. 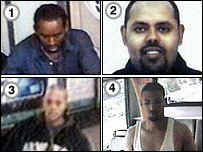 Another suspect for the failed Tube and bus bombings has been arrested in Rome. The fourth suspect was detained in Birmingham on Wednesday. Friday's raids saw armed police surround flats at Peabody Buildings, in Dalgarno Gardens, north Kensington. One of those arrested there identified himself as Ibrahim Muktar Said, 27, wanted for the attempt to bomb a number 26 bus in Shoreditch, east London, eight days ago. A second man said his name was Ramzi Mohamed, suspected of the attempted Oval Tube bombing, police said. Footage taken by a resident showed the suspects standing bare-chested on a balcony outside a flat. They had been asked to surrender to police, but failed to do so, Deputy Assistant Commissioner Peter Clarke, of the Metropolitan Police, said. "Specialist tactics" were then used, he said. Eyewitnesses had earlier talked of seeing officers wearing gas masks. The suspect arrested in Rome, who was named as Somali-born UK citizen Hussain Osman, 27, will be questioned over the bomb attempt at Shepherd's Bush station. He had been staying with his brother, who was also taken into custody, Italian officials said. Also on Friday, UK police arrested a third man in Notting Hill, west London, and two women at the city's Liverpool Street station. The as yet unnamed man, arrested in Tavistock Crescent, is said by police to be of significant interest in relation to the events of 21 July. The suspect detained last Wednesday in Birmingham was Yassin Hassan Omar, 24, who is being questioned over a bomb attempt on the Tube near Warren Street. BBC security correspondent Frank Gardner said police may have been able to make their arrests following tip-offs from the public or informants; electronic interception; or the questioning of people who were already in custody. "I understand that the questioning of those people they have in custody was very productive," he said. Our correspondent added that following Friday's arrests, the immediate priority for police was to establish if there were any further bomb plots. Also, officers would want to know if there were any explosives lying around in warehouses and who these detainees knew. Mr Clarke later confirmed to reporters that the Met would be seeking the return to Britain from Italy of Mr Osman. However, it is not yet clear if he will face any charges in Italy. Mr Clarke added that the public "must not be complacent" that the threat of attacks had disappeared in the wake of the arrests. "The threat remains and is very real," he said. Detectives believe there may also have been a fifth would-be bomber on 21 July, after a device was found on Saturday in a rucksack at Little Wormwood Scrubs, near Friday's operation. Scotland Yard described Friday as their "best day yet" since 21 July. Eyewitnesses to the raids in north Kensington say they heard three sounds like shots and a large explosion as officers wearing gas masks entered one of the properties. A police source later said no shots had been fired and that explosions reported by witnesses were the sounds of officers blowing off the door to a flat on the Peabody Buildings estate. In Dalgarno Gardens, officers were continually shouting at someone in a flat to come out. They were addressing him as "Muhammad", eyewitnesses said. The police asked him: "What is the problem? Why can't you come out? "Take your clothes off. Exit the building. Do you understand?" One resident told BBC News 24 she was inside a block of flats on the estate at the time. "They were shouting to him that he needed to come out with his arms up, in just his underwear. "He was saying to them: 'How do I know when I come out, that you're not going to shoot me? I'm scared'." Police assured him he would not get shot as long as he followed instructions, she said, and that they knew he was not a risk to the officers or the public. Officers told other residents on the 350-property estate to "get inside now". Chris Stokes told BBC News: "We got told to move out of the way by armed police and within about five minutes we heard three gunshots go off behind the block of flats at Tavistock Crescent." Allan Sneddon, who lives nearby, told BBC News: "There was this almighty bang... big enough to shake the ground."